Quartz sand crushing plant is widley used to process all kinds quartzite rock, quartz sand etc. 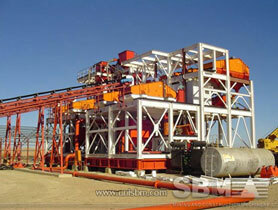 SBM Machinery offers crushing & screening plant for the clients' operators. SBM crushing and screening equipment is engineered for maximum productivity. We offer advanced, rational solutions for any size-reduction challenge, stationary or mobile. We can upgrade existing plants, deliver complete solutions and effect turnkey installations. We also supply individual crushers and screens, as well as key components and a wide range of consumables. The quartz crushing and screening plant includes three stage: coarse crushing, fine crushing and sand making. Every stage has different quartz processing machine, in the coarse crushing, jaw crusher is used to crush quartz into small sizes. In fine crushing process, cone crusher is used as finer crusher for smaller quartz particles. After these two crushing process, small quartz particles enter into the sand making machine to make sand. As a stone crusher manufacturer in China, SBM can offer types of rock crushers for quartz stone mining, such as small or large jaw crusher, secondary impact crusher, tertiary cone crusher and mobile crusher. SBM can also design quartz crusher plant flow chart and vibrating screen for quartz sand production line. "In the SBM quartz crushing palnt, the final quartz sand is divided into three types: ordinary quartz sand with 5-220 M, quartz sand refined with 5-480 M, quartz sand refined with 1-0.5mm, 0.5-0.1 mm, 0.1-0.01 mm, 0.01-0.05 mm."